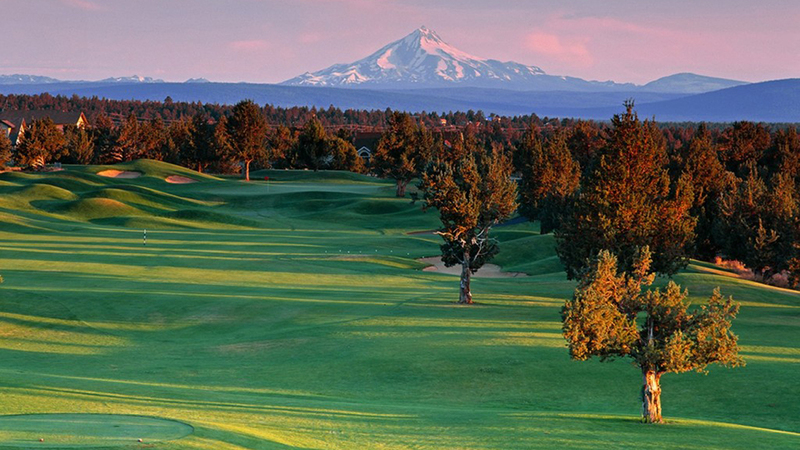 When it comes to golf in Central Oregon, challenge, variety and value are the top priorities at Eagle Crest Resort. With two championship golf courses, a Challenge Course, and a popular 18-hole putting course, links lovers are never far from their favorite pastime. Four sets of tees allow the more experienced golfers plenty of challenge and the less experienced equally enjoyable rounds. Thanks to its lower elevation, Eagle Crest Resort boasts the longest season in all of Central Oregon on the Ridge Course, open all winter long. The Ridge Course offers Cascade Mountain and valley views and favors an aggressive approach on the front and a more targeted approach on the back. Known as a “driver’s dream,” ample landing areas allow for golfers to hit a long ball on this course. The key to scoring here lies in the approach shot and negotiating the subtle nuances of each green. The Resort Course features two distinctly different nines. The front nine allows golfers to swing away and break out the driver. The back nine places a premium on accuracy, where holes 10 through 15 have out of bounds both left and right. The key to scoring well here is to keep the penalty strokes off your card. The Challenge Course is a short course that’s plenty long on satisfaction. Playing 18 really fun, beautiful holes in less than three hours is unique, just don’t let the yardage fool you.